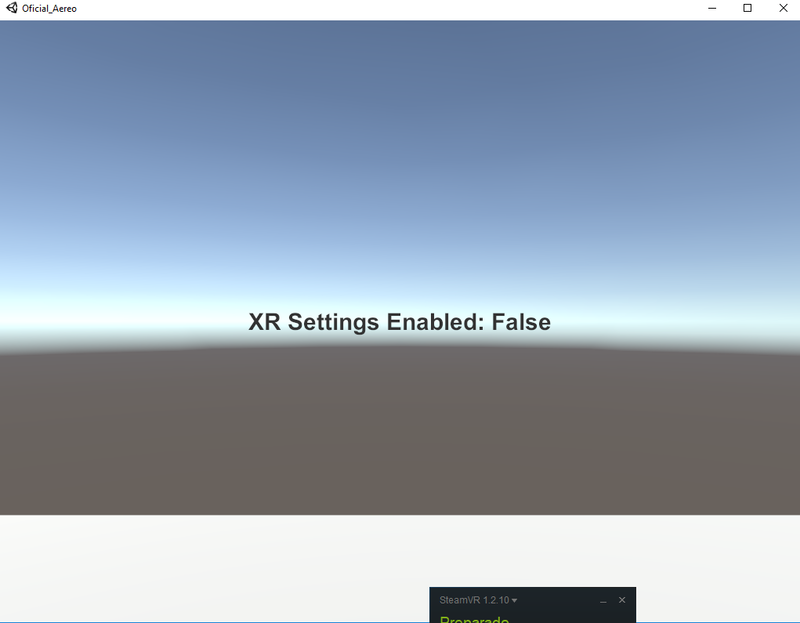 OpenVR – Build marks XRSettings.enabled as false I am having a problem in my project once I compile the build, it does not seem to detect the VR device connected. With a test script, I debugged whether the XRSettings's enabled property was set to true. On Editor mode it is debugged to true (first figure), however, it is set to false once the build is executed (second figure). I'm wondering what would be the best approach to architecture an app that contains both business logic and AR features. Let's assume I have a view which loads some data from database e.g. list of employees and I have a Augmented Reality view where I do something. What would you recommend? Any other approach? Having problems in Unity when grabbing objects: my OVRController Runs Away I have a problem with Unity to grab objects: when I do it, the OVRController (Player) start to run away and I don't want to do that thing. I would appreciate your help, thank you! I just wanted to check if anybody managed to make Vuforia + ARfoundation work together? I have one vuforia scene and one ARFoundation scene and whenever I try to run the ARFoundation Scene, it's black. Any idea why ? I am an undergraduate student and currently working as a 3D artist . I am trying to make an Architectural visualization in Virtual reality using unity. and my device is HTC vive . Currently i am stuck in a point. am trying to change any object texture in play mode. But I can't find any clue or tutorial . I saw ""VR MATERIAL MANAGER "" but i can't use that so that i am searching for any other wat to do that. Hand grab animation with Vive triggers So basically I'm trying to figure out how to animate the players hand models when you press the trigger on a vive controller. Depending on how far down the trigger is pressed, the more "clenched" the hand will be. I figured the best approach would be to get the axis value of the trigger input by setting it to a float, and setting a float parameter in the animator for the hand animation, however I can't seem to get this working. Both hand models are also rigged. Access cubemap of ARKit environment texture?? Oculus Go controller mapping I've searched and searched and was unable to find how the Oculus Go controller maps to the built in controls in Unity (i.e. edit->project settings->input). What I did was assign each button/axis to a named control of the button/axis name (i.e. "joystick button 0" = "button 0" and "joystick axis X" = "axis 1"). Then put it in a text mesh so I could see the values for each. [Tracked controllers] Issue with momentum loss on dropping objects I'm having an issue with interacting with objects. If I try to pick up and toss them, they freeze, and then fall with gravity, rather than continue it's path due to montum. I've tested this in a basic scene just to make sure there's nothing from my game interfering. I have the ViveController, with a trigger collider attach to the target cube with a rigid body, via a fixed joint.